succeeds in planting this bamboo is worthy of retelling. The first time I saw a Buddha belly bamboo, I was stunned. I couldn’t believe its body swells like skewered green balls! I happened to see for the first time a Budha belly bamboo (botanical name Bambusa tuldoides Munro and under the family Poaceae) during a seminar that I attended in Mt. Makiling in Los Banos, Laguna. I was so fascinated. There is no other bamboo as spellbinding as this one. It’s like a part of a big necklace of a giant lady. I told myself I wanted to return home with a small piece of the said specie that I could plant at home. Unknown to the security guards, I plucked a branch from its trunk. Only a friend knew of my plan. He was also fascinated by its swelling nodes. He asked me to get a branch for him too. I laughed. One morning when everybody was taking their early morning routine, I secretly got some branches of the Budha belly bamboo for me and for my friend. I hid my piece inside my bag of laundry. Upon returning home, I planted it in our backyard after soaking if first in water for around two or three days. I watered it every day. It died no matter how caring I was. My friend was not able to grow his bamboo too. It’s sad. My friend and I were so depressed, but after sometime we forgot everything about the Buddha belly bamboo. We could not see anything like it in the other gardens in our area. Even in far places during our field trips. I told myself next time when there is an opportunity; I would get a good branch that will surely live. The said opportunity came during the annual Mayohan Festival in Tayabas City. As I was strolling with a friend, there I a solitary Buddha belly bamboo beside the historical Casa Comunidad. It was planted on a big clay planter as tall as a five-year old child. Like a star! Many people were around me celebrating the fiesta. I could not get a branch from it. But I promised myself I would get a branch from it. Incidentally, my kumare is working in the office of agriculture of the city government. One evening, my kumara and I were having a chat outside a friend’s little store. 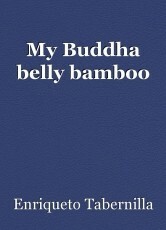 I remember the Buddha belly bamboo. I told her I really wanted to have one in my backyard. I told her it was beside the Casa Comunidad. Because we live just near the Casa Comunidad, I told her I wanted to show her the plant. Because she had nothing to do that night, she joined me. It was just like in the old days when we were strolling on the streets. I showed her the Buddha belly bamboo. She was indeed fascinated too upon seeing it. She tried to pluck a branch. It was so hard. I could not even bend it either. The people did not mind us. We approached the security guard at the entrance of the Casa. He was having some chat with friends. It was my kumare who requested a branch of the bamboo from the guard. She said she wanted to plant it herself. The kind security guard said okay if it was just a branch that we would get. My kumare said we would return home to get a bolo or a saw. The guard nodded. I got our small old iron saw. A big saw might scandalize people. My kumare started to cut a big branch with the saw. I told her it was just a small branch that I needed. But she said we must get the branch that would surely grow roots. I did not show her how grateful I was. I just smiled. We thanked the security guard after cutting the branch. The branch that we got was long. I first soaked the bamboo in water for a few days. Experience told me that bamboo soaked in water for some time would grow roots. That was what I observed once when we were fishing in the river. Bamboo whose branches touched the water grew roots. I knew it would grow into another bamboo. I also experienced seeing father putting a bamboo pole to strengthen our barbed-wire fence to secure our household. The bamboo that father erected along with the madre de cacao poles grew small leaves. I soaked the little branch of the bamboo in water for a few days before transferring it in our yard. I always changed the water to prevent the mosquitoes from breeding there. After around a week, I noticed the trunk of the bamboo turning slippery. It was though I always changed the water. I thought it was growing mildew. It was no longer good for the bamboo. It might rot in no time. I immediately planted it in my big clay plant holder. After a few days I noticed the leaves soon falling one by one. I know it would really fall. But I knew too that young leaves would sprout. I did not pluck the leaves all at once. I only plucked the dead brown ones. I let the remaining green leaves stay. If I cut all the leaves, no photosynthesis would take place. At least the remaining leaves would help the bamboo to produce food in photosynthesis to help it retain life. True enough before all the leaves fell, here comes a small sprout showing itself on one of the nodes. And besides the branch where the leaves were still intact another leaflet appeared. It was successful! I was very delighted to see my Buddha belly bamboo alive. Now I had something to show my friends about my precious bamboo. © Copyright 2019 Enriqueto Tabernilla. All rights reserved. TOK Essay: Do good explanations have to be true?